Jeremiah Evans began transitioning to organic production in in 2005. Previous to that, he was farming 2400 acres conventionally on a lot of rented land. Discouraged by the financial outlook for the farm including costs, and concerned about the risk of handling chemicals, Evans stopped farming for a while, getting trained and finding work as an electrician. But then, he realized that he didn’t want to quit farming. “I came at it from a financial standpoint: that if the numbers weren’t working for conventional farming, and we were going to try something different, why not organic?” Evans says. Evans says the learning curve during the transition to organic production was intense. “It was basically a complete re-education in farming for me, like trying to do a 180 in agriculture,” he says. One of the first things he came to realize was “that our local ag extension people don’t know how to help farmers manage an organic system; they didn’t have any valuable information for us—when you go in there, they’re ready to talk all about chemical inputs,” but not rotation planning or other cultural practices crucial to succeeding as an organic producer. “I had to learn where to go to find out information, which started a whole new association in agriculture for me, with different people,” Evans says. “I’m finding that we are networking with more organic farmers than ever before—we get on the phone and talk, and we always go to organic farming conferences in the off-season,” to learn from in-depth presentations and to network with growers and others (marketers, researchers, etc.) in the organic sector. “We found our initial organic production mentors by going to organic farming conferences—and also, by getting in touch with the next closest organic producers to our farm. We started visiting them more often, and made an effort to pay attention to what they were saying,” Evans says. A key component of financially weathering the transition period, Evans says, was “making sure, at that stage, that we weren’t depending on farm for income. At that time, my wife and I were both working off-farm. Our goal was to have the farm be sufficiently productive to maintain its own cash flow, supporting itself—so we wouldn’t have to be supporting it,” Evans says. Over the years, Evans has grown a wide range of organic crops—“rye, wheat, barley, flax (brown and golden), hemp, black turtle edible beans…currently we are growing spelt, winter wheat, red spring wheat, peas (for dried peas) and mustard going for human consumption.” He also grows red clover and biannual sweet clover for plow-down. “We use a lot of clovers inter-seeded with cereal crops—we let clover grow into the fall and terminate it by turning it in; or, we let it grow into spring, killing it then or letting it go to seed so it can be harvested as a seed crop,” Evans says. In 2015, Evans bought an additional 200 acres from his father, who was ready to retire. This expansion permits Evans to further diversify his rotation, to “grow more than one type of cereal at a time” for example. Evans makes a point of talking regularly with about 4 to 5 buyers each year, since they are an excellent source of information relevant to his crop planning. “When you are making a plan, if you can give buyers an idea of what you’re thinking of doing a year in advance, this seems to work the best,” in terms of aligning his production with customer demand, he says. “The best thing we did,” in terms of learning how to develop rotations, Evans says, was to reflect back on historical farming practices. “We tried to figured out what people were doing in the 1930s-1940s. We went around and found some old timers in their 80s and 90s, and sat down with them to talk about the way they did things,” he says. Practical financial solutions exist, Evans says, for organic farmers to buffer themselves in the eventuality that they might sometimes lose crops and crop income due to weeds. For example, Evans says, “we decided to diversify—we had goats for a while, and we added cattle—25 head.” Areas on the farm that are “too weedy to crop get cut for hay; we turn the hay into cash by feeding it to our cattle,” he says. Eventually, he plans to fence in all of the farm’s land to be able to move his livestock across the land, a hugely helpful strategy for maintaining soil fertility in the long term. In addition, there are useful equipment options that help with weeds in organic systems. In 2015, he used Robocrop, a video-guided hoe to cultivate between crop rows. “We found it really effective—it controlled about 70% of the weed population,” he says. Pre-emergence harrowing provides good control of early, small broadleaf weeds. “We put a rod weeder on our seeder this year,” he says. 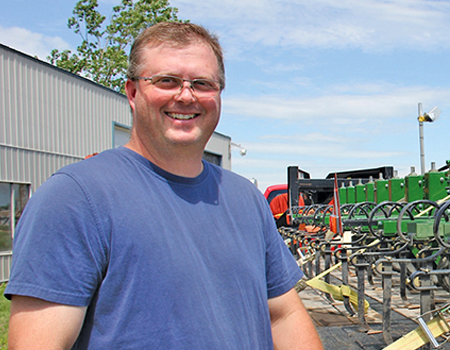 “Once our main crop is about 2 inches tall, we’ll run the guided hoe through to rid of broad leaf weeds, grasses and thistles between rows, leaving only a few in-row weeds.” In 2016, Evans plans to expand his weed management equipment to include CombCut, a machine that is capable of cutting weeds in or above crops. In recent years, Evans has also been exploring using more cover crops, attracted by their ability to help suppress weeds in fall and spring, in addition to capturing nutrients building soil carbon. “We got turned on to cover crops attending a couple seminars, learning from people like the researcher Jill Clapperton (http://www.rhizoterra.com/) and a farmer from North Dakota, Gabe Brown,” (http://brownsranch.us/) he says. When getting into crop diversification, Evans advises, “start with small plots, basing what you choose to grow in terms of economic risk management. When trying something new, ask yourself ‘what can you afford to lose?’ The biggest thing is not to bite off more than you can chew—and to talk with other producers with growing experience in crops you’re interested in. Do some in-depth research on any crop before jumping in,” he says. More than a decade into producing organically, Evans says “we’re changing things on a yearly basis, still trying to figure it out,” His early hunch that the organic production model would make sense financially, however, has been realized. “I have been farming full-time since 2012,” Evans says, satisfied in that he is able to support his salary in a manner his family finds sufficient to maintain a comfortable living.